Our patent-pending T-REX Connectors are made from 6061 structural grade aluminum and anodized for extra protection. Eleven different connector sizes are available to match your beam and configuration choices. You will be amazed how quickly your building can be assembled with our unique T-REX Connectors along with the Tooling we have available. Wood is a renewable and sustainable resource that costs less to produce than steel and concrete. When you are framing with post and beam, you can count on T-REX Connectors saving you time and money while preserving the beauty and clean look of natural wood. Do-it-yourselfers can easily master building with our connectors. Contractors and architects can offer their clients an option to other methods. Each connector comes with the corresponding amount of screws and two matching aluminum pins. GRK Caliburn concrete screws are also available. T-REX displays the wood, minimizing metal visibility. We like to say, "Easy on the craftsman, and easy on the eyes!" Our patented T-REX Connectors are made from 6061 structural grade aluminum and anodized for extra protection. We offer (16) different connector sizes to match your beam and configuration choices. Our connectors display the wood, minimizing metal visibility. This clean, sleek look provides the duality of classic or modern workmanship. Contractors and architects can offer their clients an option to other methods of timber framing. Experienced homeowners can easily master building with our connectors. Optional custom tooling for the T-REX System is shown on our Tooling page of this website. Connectors can also be ordered in a variety of custom sizes for post and beam framing, including angles. Click one of the red buttons at the bottom of this page to access Diagrams, Price List, Videos and Contact Information. We encourage you to call us to discuss your project; all orders are taken personally over the phone. There are (16) different connectors and sizes available for any type of post and beam building project. The basic connectors are offered from 5.5” x 5.5” to 8” x 12” in size. This diagonal connector is a perfect choice for knee bracing or diagonal support beams. To get the connector above the concrete, this is the perfect solution. We cut a 1” piece of black HDPE to size of connector and drill corresponding screw holes. 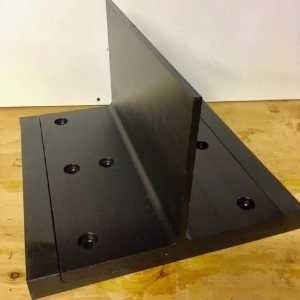 For beams larger than 8” x 12” recessing a connector into a prepared HDPE base is an excellent option. Secure two horizontal beams over one vertical post with this unique connector. This connector was created to solve a common issue of multiple connections in one area. When a corner connection is required, this presents another option.